By 2050 we will need many new homes. That’s because there are a lot of people on the planet and most of them live in pretty poor accommodation. To add to the problem the lowest lying coastal areas, which include some cities, may be starting to feel under threat from rising sea levels by 2050. People will want to move to new homes on nearby land that is slightly above the projected sea level. The good news is that it really isn’t that hard to accommodate people. Their requirements are a substantial space that is at reasonable temperature, protected from wildlife, strong enough to resist storms, and with an outside view. Do that sustainably and the job is done. 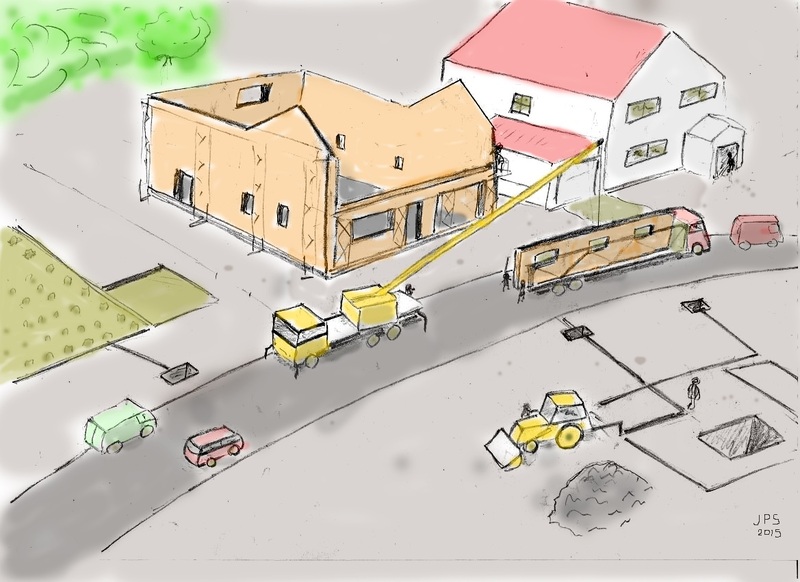 The picture shows a future house building site. The houses have features of a 2015 passive house (passivhaus in German). They are very well insulated with thick walls. They have heat exchangers so that warm air leaving the house heats cold air coming in. They use the ground deep beneath as a reservoir of heat in winter and cool in summer. The walls and roof are mostly fresh air, trapped in numerous small spaces by fibrous materials and plastic foams. The fibres come from wood, the foams from fossil fuels that can no longer be burned. Robust wooden facings provide attractiveness and durability. Most of the house is made of wood. Wood is a way of storing carbon. If we need to preserve wood what better way to do that than in the form of homes, since people tend to treasure homes above anything else. The potential isn’t huge, but it is a useful contribution. The world probably needs around a billion new homes by the end of the century. If each contained 20 Tonnes of wood and materials derived from wood, we would store 10 Gigatonnes of carbon (wood is 50% carbon). That is equivalent to extracting 37 Gigatonnes of Carbon dioxide – around our current emissions in one year. The builders in the foreground are putting in the underground heat stores, and the heat exchangers for ground source heat pumps. All of that work is best done before the house is built, at the same time as the drains, pipes, and foundations. Their digger is fuelled by methanol from the deserts. The extra cost of fossil free methanol is a small percentage of the overall building cost. In the background a new house is being built. Once the foundations are in the process is relatively rapid, with sections being built off site and craned into place – a process made possible by the use of wooden construction. These new homes are relatively large, reflecting the fact that many people will be wealthy. Most people will live in cities, but even there high rise apartments should be spacious by 2015 standards. All houses, whatever their type, will tend to use wooden construction where possible.